Home > Crochet > Free Crochet Patterns > Crochet Rose Pattern: Learn How to Crochet a Rose Wreath! 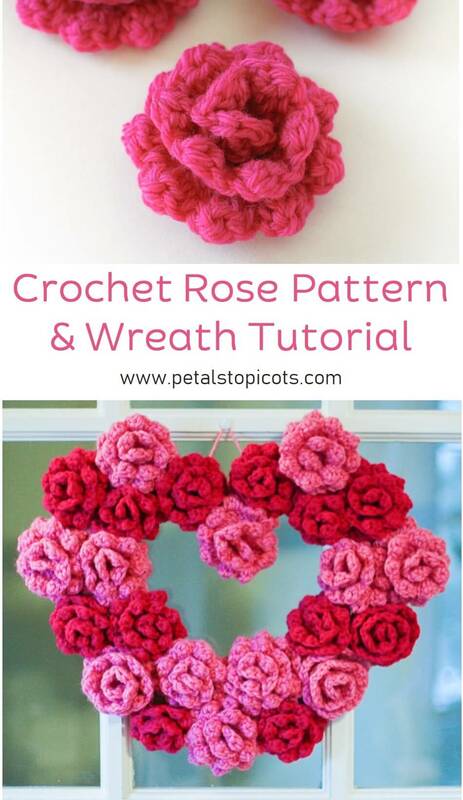 Crochet Rose Pattern: Learn How to Crochet a Rose Wreath! 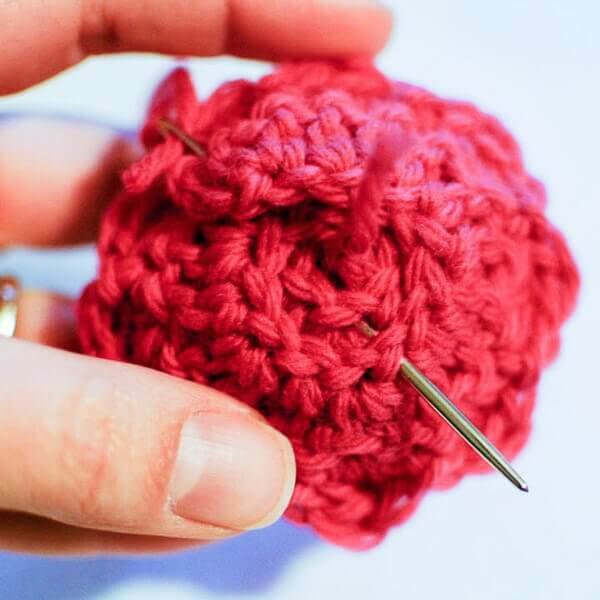 This crochet rose pattern is so super easy … just two simple rows and you’re done! It’s perfect for adding accents to your home decor or wearable accessories. Crochet up a bunch along with some buds and leaves to make a whole bouquet or use them to decorate a wreath (learn how to crochet a rose wreath at the end of this post). There are so many possibilities. Two double crochet cluster (2dc-cl): Yarn over, insert hook into specified stitch, yarn over and pull up loop, yarn over and pull through 2 loops on hook, repeat once more (3 loops will be on hook), yarn over and pull through all 3 loops. Row 1: Work 2 dc in 4th ch from hook, *1 dc in next, 2 dc in next, rep from * across, turn — 39 sts. Row 2: *Sl st in first st, ch 1 (does not count as st), 2dc-cl in next, ch 1 (does not count as st), Sl st in next, rep from * across, do not turn — 39 sts. Fasten off, leaving a tail of about 6 inches. 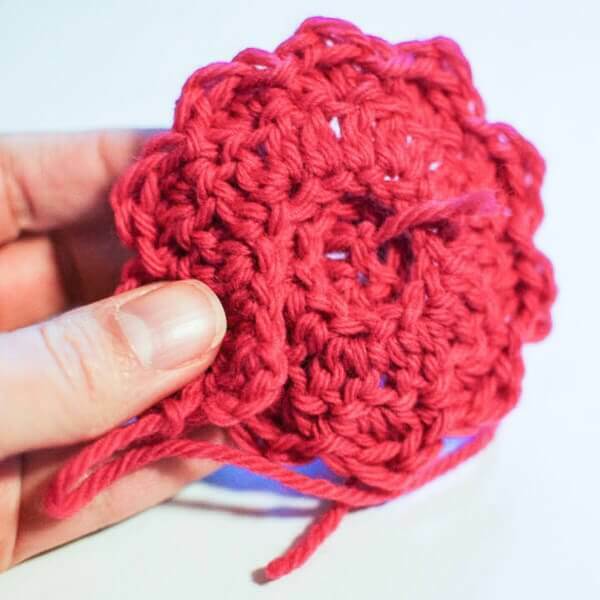 With the stitches from Row 2 facing outward, take the end with the beginning tail and start rolling into a flower shape, keeping the beginning edge tight (see photo below of how the bottom of the flower should look; beginning tail in the center and ending tail on the outside). Next, using a tapestry needle, weave your 6-in. tail through the bottom of your flower, making sure to go through all layers of the flower. Weave needle through flower to secure. That’s it! Now just give a little tug here or there to shape your rose petals as you like and you are all set to start decorating. Check out the fun project idea below! 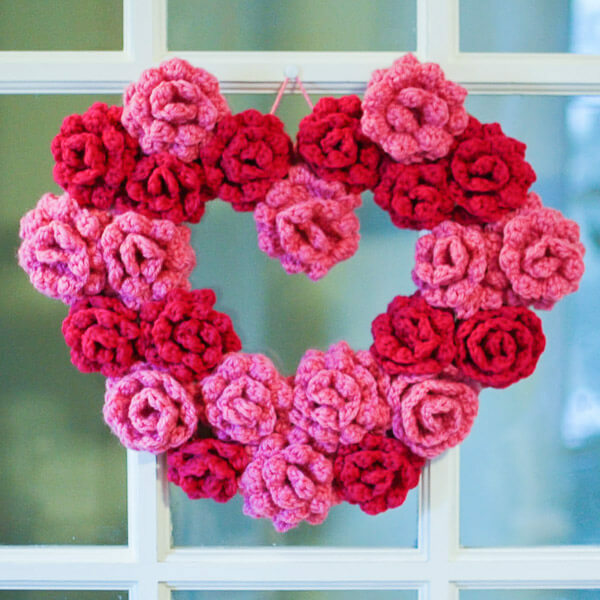 Create a whole wreath of crochet roses! I originally made this wreath as a Valentine’s Day decoration but loved it so much I kept it up all year long. Scroll down to see how I made it. To make the wreath, I cut out a heart shape from a thick piece of cardboard we had laying around. Since then though I have seen foam heart forms in the craft store that I think would be so much easier and sturdier to work with. Using the crochet rose pattern above, crochet up enough roses to cover your form. I used two coordinating colors of yarn but think it would look nice in one color or even all different colors! Hot glue the roses to cover the shape. If you are using a foam form, you can also use pins to secure them in place. If needed, crochet up a few additional roses to fill in any gaps. See more creative ways fellow stitchers have used this free crochet rose pattern to decorate or embellish on Ravelry here. I can’t seem to figure out how to sew it together by the pictures alone. The pattern is easy apart from that. When you roll up the strip, keep the bottom edges aligned. then just stitch through to secure. I just finished the wreath today and it is amazing! So easy and the instructions were clear and easy to follow. I made it as a stashbuster so I have many different color flowers and leaves on it. It is gorgeous! Can’t wait to share at my next stitch group meeting. Love the roses. I made my daughters hats and placed a rose on each one. I think they are beautiful. Thank you soooo much! Hello Kara from Everett, WA state USA! I’ve been a fan since 2012. Your rose is my favorite pattern! Thanks so much for sharing! Ripped it up and followed the video tutorial and it worked out beautifully, thank you. 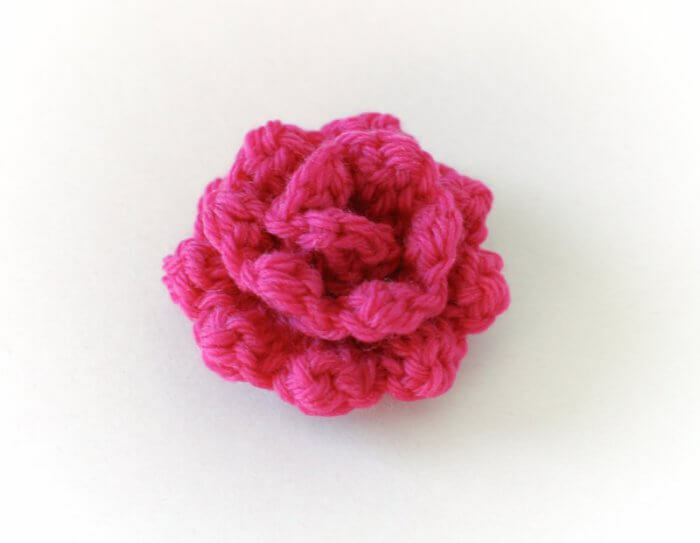 Hi Kara, I really love your crocheted rose and I have included it in a roundup on my blog. 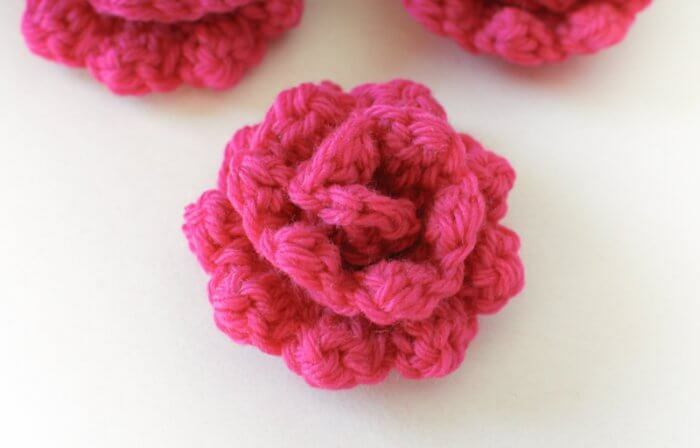 http://craftyguild.com/2015/04/15-free-crochet-rose-patterns.html. Im fairly new to crochet. I’m confused in row 2. When it says “*sl st in first st, ch 1, 2 dc-cl in next st, ch 1, sl st in next st, rep from *across” does that mean in the first st you are doing sl st ch 1, 2nd st you are doing 2dc-cl, ch 1, 3rd st you are doing sl st ch 1, 4th st another 2dc-cl and ch 1? Or does it mean each st across has sl st, ch 1, 2dc-cl, ch 1 in it? Every time I go through, I end up with 38 stitches, not 40. I did the math and I’m not crazy! 28 chains – 3 = 25 used. We start with 2 dc in the first stitch (4th from hook) so that leaves 24 empty stitches left. Half are one DC and the other half 2 DC (12 + 24 double crochets). So… 2 + 12 + 24= 38. Am I reading something wrong? Hi Sharla 🙂 No, you are not crazy, the count is off. You should end with 39 sts (the skipped 3 beginning chains count as a st). I will update the pattern. Thanks so much! Your amazing this is so beautiful! Thank you for sharing your pattern I have a problem to find where you did your wreath with roses I click the link and i went back to the same page.. How many roses you did and how tall and the width?. Please let me know where i can find the link .Thank you so much your very Talented. I tried making these, but they seem very small, and don’t look like the picture. What could I be doing wrong? Great! I will make this beautifull wreath for friends who will marry at 14th of february! Thank you very much! Could you tell me whether I would be allowed to sell the finished product I would make from this pattern, please? I would love to use it to embellish my baby blankets on Etsy. If yes, could I ask what name you would like me to list full credit to? Yes, you can absolutely sell any of your finished items made from my patterns, including these flowers. I would love if you could give credit for the pattern to Petals to Picots, http://www.petalstopicots.com. If you forward me a link to your listing, I would be happy to promote it on my Facebook page. Good luck! I’m still in the process of setting up my Etsy shop (making lots of things so it’s well-stocked from the get-go), but I hope to have it up and running by the end of the year in time for Christmas. My Etsy shop will be called ‘Happy Cats Crafts’. Thank you very much – any help I can get in promoting it would be vastly appreciated! I started crocheting a pineapple cross that has four roses on it, about a month ago. I share with family and when they saw it, I ended up promising to make 9 crosses as gifts. When I started crocheting the roses I found they were a real pain and no matter what I tried, they just wouldn’t lay flat. I tried different size hooks and different size thread but it ended up the same. So now you have shared this (these) roses and honestly, they are just perfect to use on the crosses. I just want to thank you for sharing with us. Again, thank you so much for sharing. You do beautiful work. I really appreciate you being so generous with your time and patterns! I am always searching for pretty flower patterns,especially roses,and your rose is just beautiful. Your wreath stopped me in my tracks,and it is so gorgeous! Oh awesome! I’ve been looking for a really good rose pattern, and this one is so easy! Thanks for sharing at Hookin On Hump Day, Kara! Pinning this one. How nice!! You did a great job! Oh, what a beautiful embellishment. I love it, Kara! Although I’ve mastered the standard scarf and even a blanket or two, my lack of practice leaves me a crochet novice. Still, I think I can tackle these little beauties! While perusing the blogosphere, I came across your lovely corner of the net. So happy to be following along. Very cute! These would look great on so many different projects! That’s a really lovely pattern-thank you for sharing! Love this little rose. Thanks for sharing. P.S. In your abbreviations chart, do you mean that dc = single crochet? I’m not the writer but she means double crochet. Thank you so much!! I was just going to be looking for a rose pattern. No kidding. Thank you. It’s so cute! Very pretty! Thank you for sharing your pattern with us. That would make a cute embellishment on a little girls hat & scarf set, don’t you think?